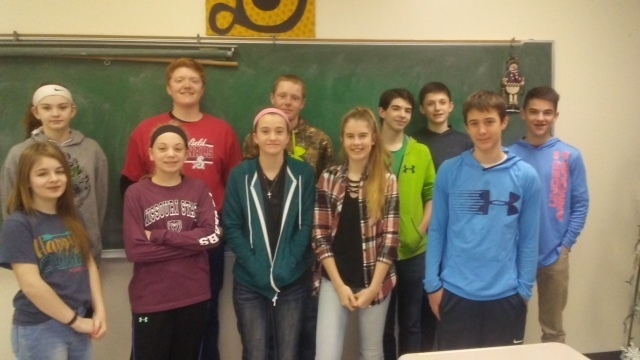 The Junior High scholars bowl team concluded their competitions for the school year last week at Golden City. The teams had a great season! The combined team finished first at the PCL tournament in January. The seventh grade and eighth grade teams finished first and second place respectively at the Golden City tournament in March. Participants included the following students: (7th graders) Luke Bushey, Chloe Cornelison, Caden Farmer, Libby Lakey, Ellie Mitchell, and Tori Shedler; (8th graders) Reed Goodman, Jacob King, Bailey McGill, Caleb Walker, and Breanna Wince; (Sponsor) Mrs. Dodson. Special thanks to Curtis and Charity McGill for their assistance at the various tournaments. Great job students!